Feel like you’re trapped in a cage with your competitors? Too close for comfort? Clawing at each other day in and day out? Inevitable? Hardly. But you’re not alone. In 1934, Moscow University professor G. F. Gause published the results of a landmark study. He placed small animals in a bottle with an ample amount of food. If the animals were of the same genus and a different species, they were able to live together peaceably. However, if the animals were of the same genus and the same species, they were not able to coexist (sound familiar?) This led to the Principle of Competitive Exclusion, which states that no two species can coexist that make their living in the identical way. Open the newspaper and read about the companies that are struggling and it’s a good bet one of the reasons is their failure to heed the Principle of Competitive Exclusion. They are stuck doing the same things in the same way as their competition. Jeff Immelt, chairman and CEO of General Electric, understood the importance of differentiation when he wrote, “GE must look different . . . act different . . . be different . . . to excel in the years ahead.” Notice he didn’t write that GE must be “better.” He specifically chose the word different and used it three times to emphasize his company’s understanding that the road to business success is paved with differentiation from the competition. How exactly are you different from your competitors? Think beyond product features. 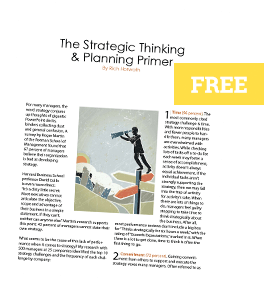 How does your strategic approach differ from that of the competition? If you can’t answer that question, one of you may soon be lunch.